Scarves are not so easy to trace through the medieval period, and most accessories that we can interpret as scarves were worn on the head as part of headdresses. Wealthy women wore high headdresses with long veils or fine scarves draped across or hanging from them - Queen Eleanor of Aquitaine (12th century) appears to have been a particular trendsetter. A fashion that appears to have begun in the Middle Ages but continued much later was the 'head-rail' - a large square of fine cloth with one corner folded back and the resulting straight fold pinned to the hair on the forehead. The rest of the fabric was left to drape down the lady's back, sometimes almost reaching the floor (like an extended version of a modern day nun's veil). Poorer women who couldn't afford the fashionable headdresses no doubt continued to wear linen kerchiefs or scarves wrapped and tied around their heads. Pictorial evidence for neck scarves largely comes from religious paintings, where the Virgin Mary and other females are sometimes shown wearing long stole-like scarves. But the Virgin Mary was an 'ideal woman', so it's questionable whether her clothing would reflect the fashions of the time. 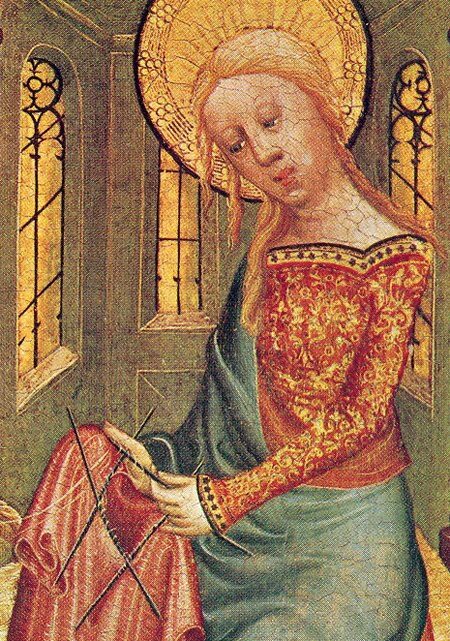 There are also several 14th century paintings of the Virgin Mary knitting (known as 'Knitting Madonnas'). Knitting developed surprisingly late and became widespread in Europe only in the 14th or 15th centuries. Initially it was mostly stockings and caps that were knitted, but it's hard to believe that knitters wouldn't have seen the advantages of knitted scarves and made them too. The many knitting schools set up in the 16th and 17th centuries certainly produced large numbers of knitted scarves. In the age of chivalry, a knight would take his lady's scarf or handkerchief into battle (handkerchiefs and scarves as love tokens is something that reappeared in the 19th century). Long strips of wide fabric were also used as a kind of bag, by placing the items to be carried in the center of the cloth and then bringing the ends up and tying over the shoulder. Such 'scarf bags' were used by soldiers for carrying food and personal belongings, and may have been the origin of the colored sashes later used as marks of allegiance and rank (see Scarves in the 17th Century). By the Tudor period, and especially the reign of Elizabeth I (1558-1603), scarves are much more in evidence, the more sumptuous the better (as long, of course, as one wasn't perceived to be 'dressing above one's station'). The Queen herself certainly had numerous 'skarfes' and 'handekercheves' in her wardrobe, including ones embroidered with gold thread, edged with silver lace, and even 'florished with golde and spangells' (sequins). She also owned a large number of tippets of sable fur. The tippet - a fur shoulder stole that hangs long around the neck - had developed during the medieval period, possibly from the long pieces of fur often attached to the 'cotehardie', the fitted medieval tunic (although Wikipedia suggests tippets developed rather from the long hanging sleeves of 14th century gowns). Tippets were sometimes made of the whole animal (such as the sable, fox or ermine) and were often lined in luxurious fabric, such as velvet. By the late 16th century, it was fashionable to tie a small narrow scarf around the neck to soften the hard lines of the fashionable ruffs. Similar narrow scarves were sometimes worn crossed across the bodice and tied at the back. The Spanish mantilla (a piece of lace or silk covering the head and hanging down over the shoulders) probably dates to the 16th century, and was to become very fashionable the following century. It seems to have developed from the manto, a large shawl that completely covered the body and was often held across the face so that only one eye of the wearer was showing!